South Korea has no plans to discuss arms reduction with North Korea until the country has made progress on denuclearization, Seoul’s defense minister said Thursday, placing priority on building trust amid persistent doubt over Pyongyang’s denuclearization pledge. 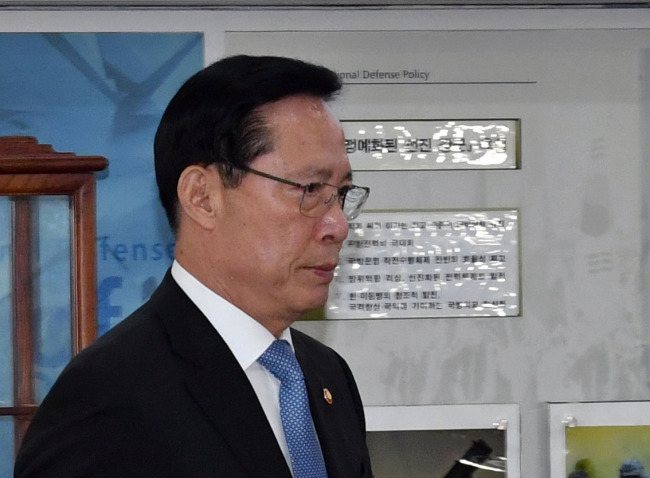 During a meeting with reporters, Defense Minister Song Young-moo said confidence-building measures will begin with basic processes -- such as reconnecting military communication lines and disarming the heavily fortified Demilitarized Zone. Once trust is built with North Korea and a detailed road map for denuclearization emerges, the two Koreas can move beyond their working-level military talks and convene a ministerial meeting to discuss arms reduction, Song added. His remarks came amid speculation that South Korea is considering withdrawing massive machinery and artillery units from cross-border region as a part of implementation of the Panmunjeom Declaration, where the two Koreas’ leaders vowed to cease cross-border hostilities. The daily Munhwa Ilbo reported the military was considering withdrawing Marine Corps’ 2nd Division and the Army’s 7th Mechanized Corps from the border region. Both troops play a crucial part in fending off North Korea in the event of an all-out war. Song dismissed those reports, saying the military has never considered troop withdrawal. Although the Army has its own relocation plan, it is irrelevant to latest detente with North Korea, Song added. Song has reportedly ordered the military to delay a plan to integrate its First and Third Armies to launch a single ground operation command near Seoul. The new command was scheduled to be launched in October. Regarding the military reform plan, Song said the scheme is in its “final stage” and the ministry will soon brief the detailed version to Cheong Wa Dae. The presidential office reportedly rejected an earlier version in May. The delay in announcing the military reform plan has been feeding speculations that the Moon Jae-in administration may be seeking to reduce the scope of the reform and suspend scheduled procurement projects to avoid dampening the inter-Korean detente. “It is not like there is a conflict of opinion between the Defense Ministry and Cheong Wa Dae over the military’s reform plan. If you continue to review a plan, you are bound to see room for improvement. ... We are in the final process and will soon provide an official briefing.